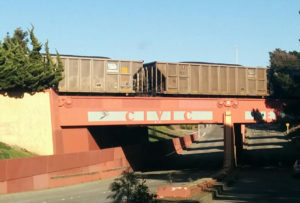 Why does the East Bay, a region famous for its environmental leadership, still have coal trains coming through our communities? Why do we have huge, uncovered piles of filthy, dusty coal sitting right next to our Bay at the Levin-Richmond Terminal? Why is the Port of Richmond one of the last three ports left in the state to export this dirty fossil fuel when California doesn’t even use coal power? Within a month the Richmond City Council will vote on an ordinance that will prohibit new coal handling and storage infrastructure and phase out existing coal operations. No Coal in Richmond is going door-to-door in some of the most heavily affected neighborhoods to generate awareness and collect signatures on a letter to city council members. We’re asking them to enact the strongest possible measures to end this public health and climate menace. We will also be going out every weekend between now and when the ordinance comes before the city council. And, if you have a couple of hours at another time and can door-knock with a local canvasser, please send an email to action@sunflower-alliance.org. Let’s do this!